For over 25 years, Microflex has been developing gloves specific to our customers' needs. As a leader in the medical examination glove marketplace, Microflex designs gloves to meet or exceed the expectations our customers hold. Microflex® MidKnight® Black Powder-Free Nitrile Examination Gloves. Offer the superior combination of durability and security for day-to-day hazards. 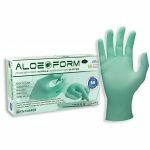 powder-free latex exam gloves provide excellent chemical and biological barrier protection.